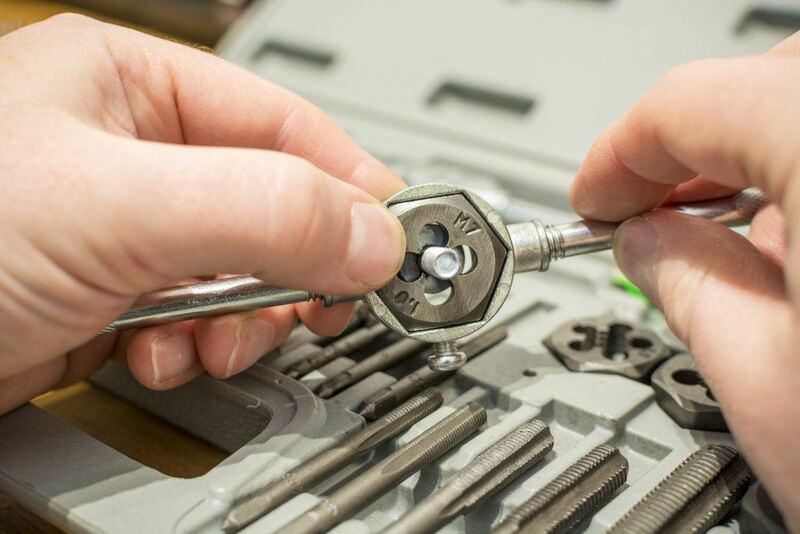 Whether you are working in a garage or you just totally enjoy metal workpieces, you should know that a tap and die set is a necessary toolkit for your workshop. This set comes handy whenever you need to create screw threads. Using the tap, you’ll be able to form the female part like a nut while using the die, you can create a neat male part, in this case, the bolt. It’s amazing how this simple tool set can make the entire process of putting everything together straightforward and pretty effortless. For today’s article, I will be sharing with you five of the best tap and die set that will help you work on every workpiece with grace. So if you want to invest in a set that will have you going back to the store every now and then, please keep on reading below. GearWrench 3887 made it on top of this list for a lot of reasons. It has been a reference for semi-professional users for years. First of all, this set comes with no less than 75 taps and dies pieces made from sturdy carbon steel. You will get 34 taps as well as 34 dies in this set. Furthermore, it uses both the SAE measurement system as well as the metric system. Another thing I was impressed with this set is its ratcheting handle. Its double-ended ratchet will allow you to simply crank backward a short distance rather having to change your hands' position every fraction of a turn. 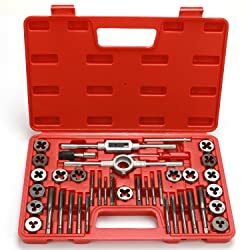 In addition to that, its carry case is made from a sturdy plastic that will let you easily store, keep everything organize and carry your tap and die pieces. Once you will get used to the location of your most commonly used pieces, I’m sure you will be able to save plenty of time. Best of all, you will also get comfortable and durable T-wrench handle with what you pay for. And as a complementary accessory, you will also get a tough screwdriver. IRWIN has again produced another amazing and easy to use toolkit with this deluxe set. 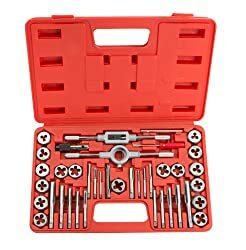 This tap and die set is quite big since it is composed of 117 pieces, it will definitely be able to cover almost any tap and die task you will ever need to perform. You will get machine screw, fractional and metric plug type taps as well as hex dies, high-speed steel drill bits and screw extractors. There are also 36 pieces of HSS drill bits along with the rest of your set. And take note, all of these tools are perfectly created for hand-threading a variety of materials. All of the pieces were made of high carbon steel. I was pretty impressive to see how the pieces were arranged in a distinctive way too, so you will never at a loss whenever you are looking for a specific size of a tap or die. Everything from the spiral screw extractors, even with the t-handle wrench is just right where it is supposed to be. I must say this is a pretty comprehensive set, you will never go wrong with this one. It has been specially designed for both mechanics and craftsman and has been made suitable for both repair and maintenance. IRWIN guarantees that you will get to enjoy precise work and will be satisfied with the result with this set. Next on the list is an entry-level style of kit. It is almost half as small as our first product as it only comes with a total of 40 pieces. Though you will be missing out on some sizes of tap and dies compared to bigger sets, this will help keep the price down. But you should not underestimate this tap and die set! It’s actually made from bearing steel with high quality and extremely sturdy finish. It’s also good to see that the manufacturer cut these taps and dies using CNC machinery in order to make sure it will be the most accurate tools you will ever have. This is definitely a decent set for starters and at an excellent price. The first thing you will notice with this tap and die set will definitely be its sharpness and perfection. All of the pieces are made from titanium material that makes the cutting-edge way too much sharp. It is actually up to 20 times longer than steel. One of the incredible features of this set is its repairing damaged threads. All you have to do is to cut through damaged threads or new materials. This will allow you to save some time and avoid buying new thread. This is amazing if you think how much help you can get out of a usual tap and die set. Another thing I like about this is its exceptional packaging. The entire package comes in a durable and reliable hard case bag that is very portable and has enough storage. It also has tags for easy identification. 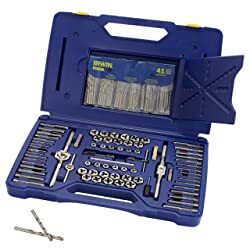 And to make you even happier, this set of tools come with a professional grade steel construction; this makes sure you can have the best of heavy uses. The set’s durability is definitely incredible enough to serve you and being with you doing quite a lot of works and complex cases for a long time. Anyway, this set is composed of 45-pieces kits. This includes T-handle tap wrenches, thread pitch gauge, and adjustable die wrench and screwdriver. I was surprised how affordable the price for this high-quality set which has a lifetime warranty to boast. This product comes in a brightly colored case packed with high-grade milled alloy tool steel pieces that are perfect if you will be doing moderate cutting work. 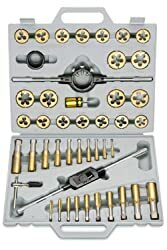 Well, this set is composed of 39 pieces that offer sufficient opportunity of smooth threading at your home or your garage. It's not hard to see the outstanding strength and durability of each piece. And the best of all, they can easily repair damaged threads or get through new metal sheets. All of the pieces come with a metric style, making it more ideal all-purpose tools. As long as you are using suitable technique and appropriate lubricant, you will be able to cut down mild, carbon, alloy steel including brass and bronze. Overall, the combination of all of the pieces in this set is an easy startup for smooth cutting. It is fairly preferable for almost all hand threading task. Though this is not a professional class set, it is way ahead compared to similar models in its price range. Plus, TEKTON has a brilliant reputation when it comes to customer service. Just like every other tool, there are several variables you need to consider before you decide on purchasing the item. Now, let's take a look at some of these factors. First and foremost, you need to make sure that the various components of your chosen tap and die set comes with excellent build quality. We know for a fact that there is a very strong relationship between the tool’s price and the quality you can expect. So I highly recommend that you should not purchase cheap full sets no matter how they may look like a good value for money; we don’t want to get frustrated once it starts breaking halfway through a job. Check the worth of the product in order to determine whether it is a value for money product. You can measure this by checking out what the product can offer in terms of tools, casing, and materials used. To make sure the set’s quality, check out the material it is made of. Buying tools made of low-quality materials will only cost you in the long run. Carbon Steel and High-Speed Steel are two of the most famous materials. Carbon steel is an excellent material as it is very strong steel; it won't easily bread. High-Speed Steel, on the other hand, is best for creating nuts and bolts but they are more used for industrial scale. They can also be very expensive. So if your purpose is for non-industrial use, Carbon Steel is a good choice. The size of the tap and die set is another important factor you need to check out. If you are living and working in the USA, then you will definitely be going to need the SAE size (halves, quarters and eights). Moreover, you also need to be exact when it comes to threads. This means you should opt for a tap and die set that comes in several various sizes within the kit as much as possible. With this in mind, the best value for your money would be a tap and die set that comes in a combination of both common SAE and metric sizes. In this way, you will be able to work precisely as needed for quality results. Make sure that your chosen set has at least the three basic taps, these are tapper taps, plug tap, and second tap. All these taps are important in making clean clear threads. Don’t forget to check the case too. It’s important that is also made of sturdy material. You don’t want tossing it at the back of your car, only to find out with a broken case. Make sure that each piece have its own place and everything is well organized. It’s important that you will also get a tap wrench and a T-handle. Make sure that both are also made from the same sturdy materials that the set is made of. It is important that the handle that is hassle-free to use. Of course, we don’t want to use a handle that is heavy and difficult. If you need it to push too much, you might end you up with stripped threads and wrecked tap and dies. 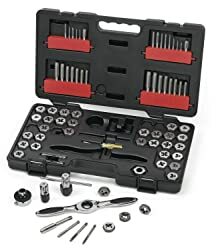 Owning the best tap and die set is absolutely beneficial especially if you are working in a repair business or a garage. So I hope this article will be able to help you know what kind of tap and die set you should purchase. Don’t worry, all of the products I mentioned above possessed superb quality and were built to last for a long period of time. Anyway, if you still have any more question, please don’t hesitate to drop it in the comment section below. I will get back to you as soon as I can.